US stock market operator Nasdaq is offering to buy its Swedish counterpart OMX in a $3.7bn (£1.8bn) deal. The offer comes after Nasdaq was rebuffed in its attempts to buy the London Stock Exchange, failing with a $5.3bn bid earlier this year. OMX operates the Nordic Exchange, which gives investors access to leading firms in Scandinavia and the Baltic states. Nasdaq and OMX said their tie-up would create a business that served more than 4,000 firms in 39 different countries. As well as operating the Nordic Exchange, OMX provides technology for stock markets around the world, including Hong Kong and Singapore. 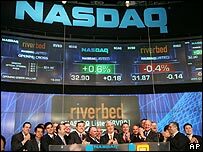 Shares in the technology-dominated Nasdaq index closed down 3.35% to $32.75 as the trading session ended in New York. Nasdaq's bid has been recommended by OMX's board and has the backing of investors holding 16% of its shares. Under the terms of the proposed deal, Nasdaq shareholders would own 72% of the combined business with OMX investors owning the remainder. The new business would employ more than 2,000 staff in 22 countries and process more than $60bn in daily share transactions. "The future of exchanges is about technology, flexibility and scale," said Robert Greifeld, Nasdaq's chief executive, who will head the new business. "Nasdaq and OMX together deliver all of these benefits." OMX said the tie-up would enable the business to invest more in product development. "Issuers, members, information vendors and investors on both Nasdaq and OMX Nordic Exchange will all benefit from its new global context," said chief executive Magnus Bocker. The industry has seen a wave of consolidation in recent times as exchanges have tried to get a competitive lead in terms of cost efficiency and technological development. The New York Stock Exchange merged with Euronext, the operator of stock markets in Paris, Brussels and Lisbon, in a $14.3bn deal.